Some people view leopard print as wild, and well it is! But it’s also incredibly stylish and has a place in every women’s closet. You just have figure out what style of leopard print works for you. The best place is to start small: accessories. Accessories are the best area to invest in leopard print whether you choose a bag, heels, a scarf or jewelry. A pair of leopard print heels are perfect for adding zest to a basic black dress whether the occasion be a night on the town or a day in the office. Leopard print isn’t just a night time accessory. It’s great for adding edge to a casual outfit. Don’t be afraid to mix leopard print with color (like these coral pants) or with unexpected fabrics (like denim or lace). Mixing leopard with other colors and textures will create a one-of-a-kind look. 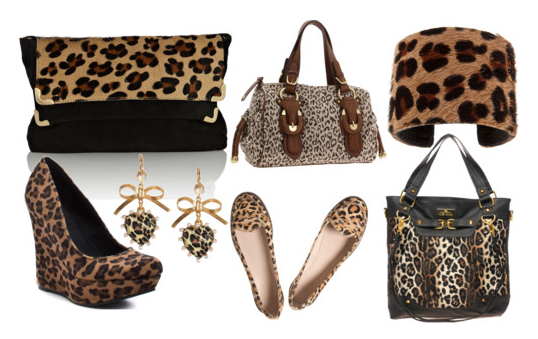 Leopard print is a lot more versatile then you think which makes it a necessity for any stylish closet. Don’t limit yourself to pairing it with solid, basic colored pieces. You’ll be amazed at how easily you can pair them with different patterns once you try. Pair your leopard print heels with a polka dotted dress, or stripes or florals. The combination will create a fashion-forward look. Once you begin to mix and match your leopard print accessories with different pieces in your closet, you’ll be amazed at the whole new world of outfit options that will open up to you. This entry was posted in Building the Perfect Closet and tagged building the perfect closet, leopard print accessories, wardrobe essentials, wardrobe staples, wearing leopard print. Bookmark the permalink. i always find leopard adds interest to any outfit, great post! Found your bloggity blog on IFB! I just got a leopard shirt the other day, it’s my new favorite thing!! Hi I love your blog and Leopard print is a my fav. Thank you for joining my group on IFB. I love your blog Im go glad you joined. I followed you on twitter and liked your FB page. I would love if you could return the favour.